You’ve got questions. We’ve got answers! So let’s jump into some VT100 drop bag instructions. We cover basic drop bag instructions, which aid stations drop bags can be sent to, an FAQ you may be wondering about when it comes to Camp Ten Bear, and a courtesy reminder for how you can help our volunteers have a great day too. Further details are also located in: The Runner’s Handbook. How many drop bags: Runners and their pacers are permitted to have one (1) drop bag per aid station that allows crews. See the aid stations lists below for 100-milers and 100-km runners. Who: While we do allow any runner to have a drop bag, we request that runners with crews not use drop bags (unless your crew won’t be at an aid station). We have a ton of solo runners, and don’t want the volunteers to get bogged down with bags that your crew will ultimately pull and use for you! Size: Drop bags should be soft sided, waterproof and durable. A small backpack or gear bag about 9” by 9” by 16” (or smaller) should be sufficient. See below for an example of what NOT to do. Timing: Drop bags must be in place on Silver Hill by 5:30pm on Friday. Unfortunately we can not accommodate runners who are postponed (even by emergencies or travel delays). If you arrive late, you will have to do without your drop bags.We will do our best to return all drop bags to Silver Hill by 12 noon on Sunday. Please don’t forget to pick them up, because the RD stinks at mailing them back! Every drop bag must be marked clearly and largely with: Bib Number, Last Name, and Aid Station Name. Bib Number: Your bib number will be posted on the entrants list page. If you don’t write your bib number clearly, your bag will be harder to find during the race. Aid Station Name: If you don’t write the Aid Station Name clearly, your bag will be harder to find during the race. Q. How should I mark my drop bags for Camp Ten Bear? At the end of the day, The Vermont 100 is not responsible for lost, stolen or damaged bags or belongings. Volunteers move upwards of 150 bags to each station and we do our best to do this carefully and with your best race in mind. Pack appropriately! We e can not accept unreasonably large or unwieldy drop bags. The more stuff you cram into your drop bag, the more valuable time you’ll lose rummaging through it to find what you need. The image to the right is in fact a real thing that happened. 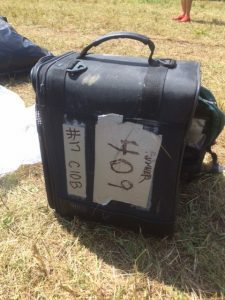 One time we got luggage… don’t do this to our volunteers! Thank so much and looking forward to helping you do your best on race day! PS – Want to know more about prepping for your VT100? Check out our quick post for Your VT100 Weekend Checklist.